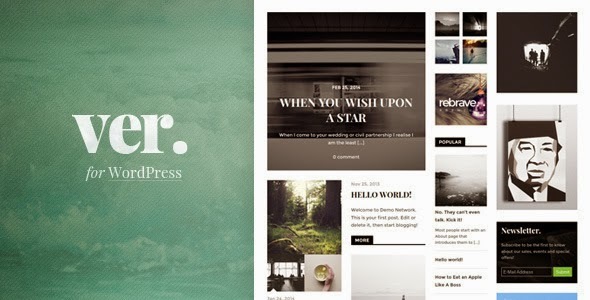 Versatile is a quintessential WordPress theme for a serious, successful online publisher. Select from 3 different grid views (masonry, brick, and photogrid) and customize it via Theme Customize to suit your need. With support of various post formats, create your own visual style. Versatile features a responsive layout, from video to off-canvas sidebar, which means it’ll look great on a tablet or phone. So, no matter what screen your visitors are using, VER will fit perfectly. Premium WordPress theme for Magazine and Online News Website. Theme customizer: Make the theme really yours and view your changes on the fly. Custom background and accent color control. Custom post formats that perfectly blend with content. Responsive layout with off-canvas sidebar. It fits perfectly on any screen. Great typography and white space with minimalistic design approach. Customized-ready Newsletter widget from Genesis Enews. Item Reviewed: Versatile Magazine Theme Focused on Content 9 out of 10 based on 10 ratings. 9 user reviews.